That’s why you need to be prepared at all times, even if that means accepting a dangerous mission at 2 A.M.! No worries though. This tuxedo union suit helps keep you ready for action. Not only does it provide you with comfortable sleepwear, but it also lets you have an outfit that will let you play the role of a cunning agent of espionage. 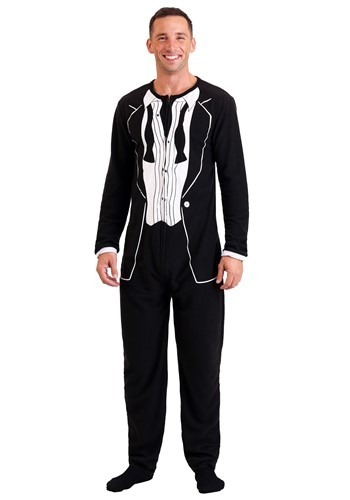 This tuxedo union suit combines the comfortable feel of pajamas with the uniform of a suave secret agent. The single piece jumpsuit is made from a soft material that’s comfortable for a light snooze and it fits with a zipper in the front, making easy to put on and take off. The front is also designed to look like a full-on tuxedo, so you can do your best James Bond imitation when you wear it. Will you save the world from some crazy mastermind or will you just resign yourself to a nice little nap on the couch? Your mission is completely up to you when you wear this comfy union suit. However, if you do plan on saving the world, you might want to equip yourself with a few toy gadgets to get you through the day! If you plan on taking a nap, well, then this tux is all that you’ll ever need!